In nearly 30 years of practice, John Robert Wiltgen Design, Inc. has created an immensely diverse portfolio of design – a rich retrospective of style that encompasses nearly every imaginable look. Our constantly refined body of work continually pushes our panache to greater limits, enabling us to draw on our extensive repertoire for inspiration to even greater challenges. 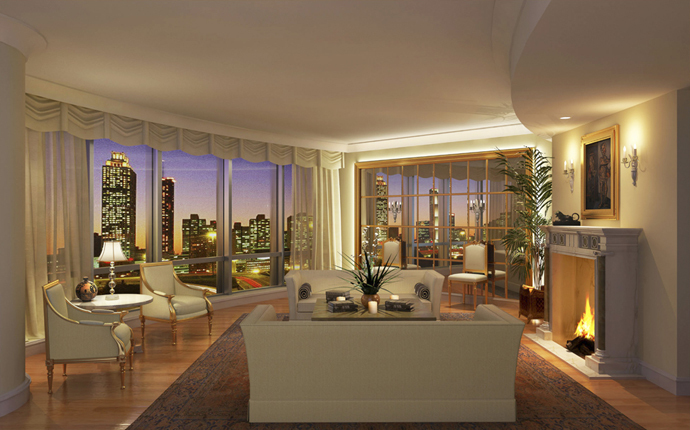 Two examples of homes at Chicago’s Trump International Tower illustrate our ability to translate the style preferences of residents with totally opposed style goals. Working in a far more traditional aesthetic than Trump’s exterior suggests, John Robert Wiltgen Design created a residence that bows graciously to classic restraint. To enhance the Tower’s world-class views, our design concept features a mirrored wall adjacent to the floor-to-ceiling windows. Gold leaf moldings frame the mirrors, which we backlit with energy efficient LED lighting, and provide that signature touch of glamour and drama for which we are noted. A 19th century Tabriz garden carpet from Northwest Persia anchors the furniture arrangement. A reproduction antique fireplace mantle will finish the room’s firebox. Authentic antique furnishings – 19th century Louis XVI-style bergères and hand-carved side chairs – underscore the Continental aesthetic. A crystal lamp atop an occasional table of inlaid bone and prized accessories – an Apulian red-figured spherical Pyxis (circa 350-330 B.C.) and an Etruscan bronze Lion (circa late 6th century B.C.) complete the serene setting. The result: Evidence that when accomplished with thoughtful care, an intensely traditional look does not compromise contemporary surroundings. 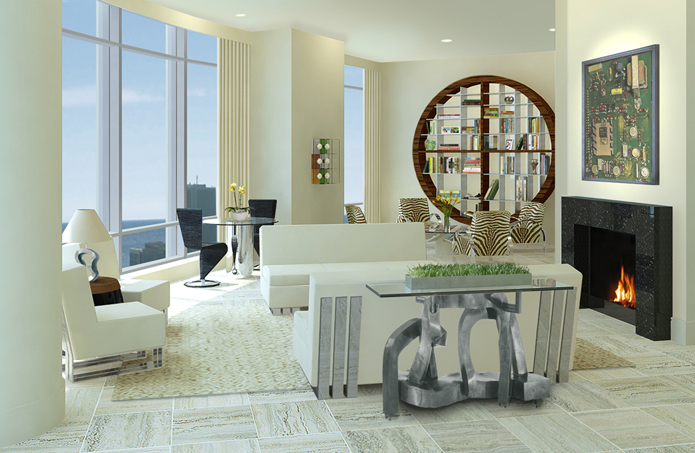 In an 86th floor penthouse, a collection of original 20th century art and furniture sets a strident, sculptural tone that emulates the Tower’s architecture. An airy open plan in the home’s public spaces, 12-foot ceilings and futuristic state-of-the-art lighting dramatize the scale and intensity of highly stylized art and incomparable exterior views. Furnishings, many of which took prizes in prestigious competitions, showcase unexpected materials and shapes. Exquisite finishes and textiles create incredible polish. The result: A look that throbs with the beat of a worldly, savvy owner. Though both residences are within the confines of Trump Tower, the settings represent a sampling – a mere touch – of the enormous diversity in design that propels our creativity at John Robert Wiltgen Design. These are environments that easily lend themselves to other luxury high-rise buildings. Please feel welcome to share these examples of our work with others interested in the art, architecture and design of exclusive residences. I love the palate of pastels and modern design you did for the 86th floor Penthouse. The web site is looking fabulous, Bravo!